(2010) "Every Teardrop Is a Waterfall"
Chris Martin wrote the song in December 2008. The morning after he began work on "Christmas Lights", he performed a segment of the still in-progress song for journalist Steve Kroft during an interview for the American newsmagazine program 60 Minutes. For the week ending 18 December 2010, "Christmas Lights" both debuted and peaked at position number 25 on the U.S. Billboard Hot 100 singles chart and position number 12 on Billboard's Hot Digital Songs chart. A live recording of the song was also featured as the closer track on the band's Live from Spotify London live EP, released exclusively on Spotify on December 2016. The discussions about the video started about one month before its release. The original plan was to film a simple video at Oxford Street, as the place is mentioned in the song's lyrics. After that many other options were analysed, like a similar video to The Beatles' video for "All You Need Is Love", with the band and friends at the studio. But that idea was left out as Coldplay were in the middle of the production of Mylo Xyloto, and that could disrupt the flow of the recording. Another idea for the video included filming at the Willesden Music Hall. Finally they decided to invite the designer Misty Buckley to the project and the ideas for the final video started to take shape. After a meeting at the studio called The Bakery all the ideas had been set up and the only thing missing was the location for the shooting. Some places suggested were the tunnels under Waterloo and the roof of John Lewis. However they opted for the South Bank just five days before the shooting of the video, to tie in a line about the meeting of the sea and the city. Coldplay began filming the music video on 24 November. The video appears to be one continuous shot, and while it might have been filmed with a single camera, the amount of takes in the video is unknown. Whether this means the finished product is a mix of many clips seamlessly stitched together is unknown. It begins with the starting up of a record player, and the camera panning across a multicoloured player piano, then the four members of the band. Martin begins to sing the first verse as the camera pans and zooms out to show the piano - which is now next to him - then back. Martin has changed his position, and the rest of the band are nowhere to be seen. Martin rises up from the stage where he is lying, then begins to play the piano, which is now on a stage in front of the Thames. Curtains open to reveal the rest of the band, who join in playing the song, accompanied by fireworks and three violin-playing Elvises (who are friends of the band: the British actor Simon Pegg, the 'fifth member' of Coldplay Phil Harvey and Tim Crompton, friend of the band and frontman of The High Wire). One hundred fans of the band appear in the music video; they release coloured balloons from a boat on the Thames whilst singing along to part of the song. "Credo Elvem Etiam Vivere" is written across the top of the stage. In Latin this means "I Believe Elvis Yet Lives". This is likely connected to the three Elvises appearing in the video, which is, in turn, connected to the lyrics of the song. The video was directed by Mat Whitecross, a long-time friend of the band and director of several of Coldplay's other music videos, such as "Bigger Stronger", "Lovers in Japan", "Every Teardrop Is a Waterfall" and more recently, "Paradise". Just hours after the release of the video it was removed from YouTube after the IFPI claimed a breach of copyright, despite the video being on one of Coldplay's official channels. However, it was eventually uploaded once again. Yellowcard recorded the song for the Fearless Records Punk Goes Christmas compilation in 2013. Kylie Minogue recorded the song for her 2016 album Kylie Christmas: Snow Queen Edition. Straight No Chaser covered the song for their 2016 album I'll Have Another...Christmas Album. ^ a b "Coldplay - Christmas Lights release". Coldplay.com. 24 November 2010. Retrieved 2 December 2010. ^ "Coldplay Oracle". 8 December 2010. ^ a b "Coldplay's "Christmas Lights" Unplugged". 60 Minutes. Retrieved 22 January 2018. ^ Kroft, Steve. "A Look At The "Mystery" Of Coldplay". 60 Minutes. Retrieved 22 January 2018. ^ "Coldplay Oracle - What Did You Mean..." Coldplay.com. 1 December 2010. Retrieved 2 December 2010. ^ "Coldplay Oracle - Is Christmas Lights..." Coldplay.com. 29 November 2010. Retrieved 2 December 2010. ^ Slender Fungus (11 December 2010). "News - Interview with Mat Whitecross (Christmas Lights video director) - pt 1". Coldplay. Retrieved 30 June 2011. ^ "Coldplay Oracle". 29 November 2010. Retrieved 3 December 2010. ^ "Coldplay Oracle". 1 December 2010. Retrieved 3 December 2010. ^ "Latin Mottos, Latin Phrases, Latin Quotes and Latin Sayings". Yuni.com. Retrieved 30 June 2011. ^ "Image of Coldplay.com Home". 2 December 2010. Retrieved 2 December 2010. 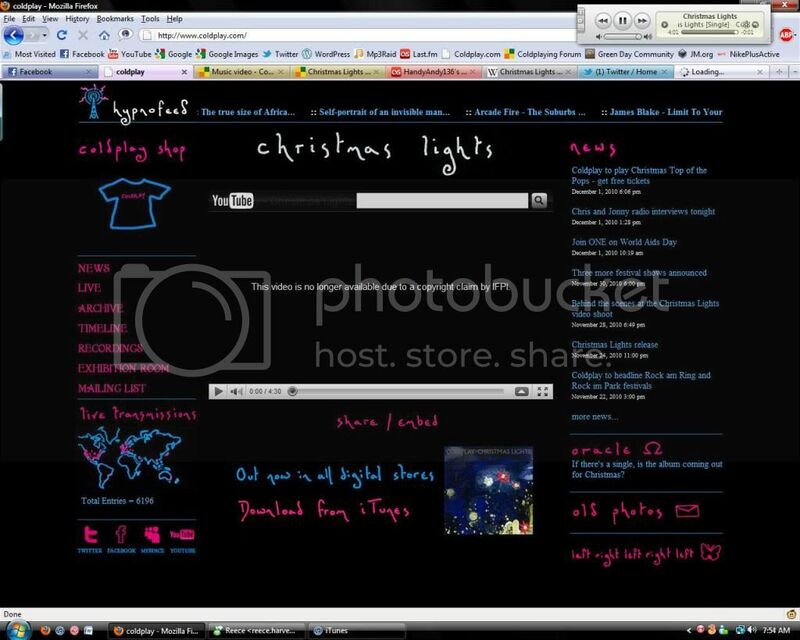 ^ "Australian-charts.com – Coldplay – Christmas Lights". ARIA Top 50 Singles. ^ "Austriancharts.at – Coldplay – Christmas Lights" (in German). Ö3 Austria Top 40. ^ "Ultratop.be – Coldplay – Christmas Lights" (in Dutch). Ultratop 50. ^ "Ultratop.be – Coldplay – Christmas Lights" (in French). Ultratop 50. ^ "Coldplay Chart History (Canadian Hot 100)". Billboard. ^ "Danishcharts.com – Coldplay – Christmas Lights". Tracklisten. ^ "Coldplay: Christmas Lights" (in Finnish). Musiikkituottajat – IFPI Finland. ^ "Offiziellecharts.de – Coldplay – Christmas Lights". GfK Entertainment Charts. ^ "Chart Track: Week 49, 2010". Irish Singles Chart. Retrieved 17 December 2018. ^ "Italiancharts.com – Coldplay – Christmas Lights". Top Digital Download. ^ "EHR top 40". Retrieved 22 August 2012. ^ "Dutchcharts.nl – Coldplay – Christmas Lights" (in Dutch). Single Top 100. ^ "Charts.nz – Coldplay – Christmas Lights". Top 40 Singles. ^ "Norwegiancharts.com – Coldplay – Christmas Lights". VG-lista. ^ ds. "Sns Ifpi". Ifpicr.cz. Retrieved 30 June 2011. ^ "Spanishcharts.com – Coldplay – Christmas Lights" Canciones Top 50. ^ "Swedishcharts.com – Coldplay – Christmas Lights". Singles Top 100. ^ "Swisscharts.com – Coldplay – Christmas Lights". Swiss Singles Chart. ^ "Coldplay Chart History (Hot 100)". Billboard. ^ "Coldplay Chart History (Adult Alternative Songs)". Billboard. Retrieved 4 June 2014. ^ "Coldplay Chart History (Adult Contemporary)". Billboard. ^ "Top 100 Music Hits, Top 100 Music Charts, Top 100 Songs & The Hot 100" (in Japanese). Billboard.com. Retrieved 24 March 2012. ^ "dutchcharts.nl - Dutch charts portal". dutchcharts.nl (in Dutch). Hung Medien / hitparade.ch. Archived from the original on 22 November 2010. Retrieved 2011-01-03. ^ "FIMI - Federazione Industria Musicale Italiana - Ricerche e dati di mercato". Fimi.it. 17 January 2011. Retrieved 30 June 2011. ^ "Danish single certifications – Coldplay – Christmas Lights". IFPI Denmark. Retrieved 20 December 2018. Scroll through the page-list below until year 2018 to obtain certification. ^ "Italian single certifications – Coldplay – Christmas Lights" (in Italian). Federazione Industria Musicale Italiana. Retrieved 10 January 2013. Select "Tutti gli anni" in the "Anno" drop-down menu. Select "Christmas Lights" in the "Filtra" field. Select "Singoli online" under "Sezione". ^ "British single certifications – Coldplay – Christmas Lights". British Phonographic Industry. Retrieved 19 December 2016. Select singles in the Format field. Select Gold in the Certification field. Type Christmas Lights in the "Search BPI Awards" field and then press Enter. ^ Horansky, TJ (31 October 2013). "Fearless Records release 'Punk Goes Christmas' commercial". Alternative Press. Retrieved 3 November 2013. This page was last edited on 13 April 2019, at 23:49 (UTC).